Minutes from Disney and the shops and restaurants of 192. This top resort has impressive entrance.Guarded entry provides 24/7 security. Active Clubhouse often has orgainsed events beside the community pool and tikki bar. Sports facilities include volleyball and tennis courts. There are also several scenic Nature trails for those who enjoy walking and jogging. This will be our fifth visit to Florida and each time we have used PRV- Vacations. We have not hesitated in returning to PRV as on each occasion Annette and Stewart have provided us with great family places to stay. The homes are immaculately clean, well-appointed and near all the attractions. Their Knowledge and recommendations of the local area are also great. If we have had any issues we have been confident in knowing that they will be resolved quickly. Pricewise PRV have always been very competitive. We would recommend them every time for the perfect holiday. When arriving to this vacation rental my family was astonished. This home was beautiful inside. 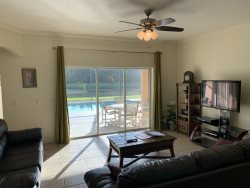 We loved every minute in this home and would recommend this home to anyone who is looking for a vacation rental. There was so much space in this house no one felt crowded at any point. This was a "last minute" booking .Once at property, everything we needed to know was provided - and then some! The home is spacious and comfy. This home met all our expectations. The booking was smooth and we were provided will all the tools we needed to have a memorable time in Florida.